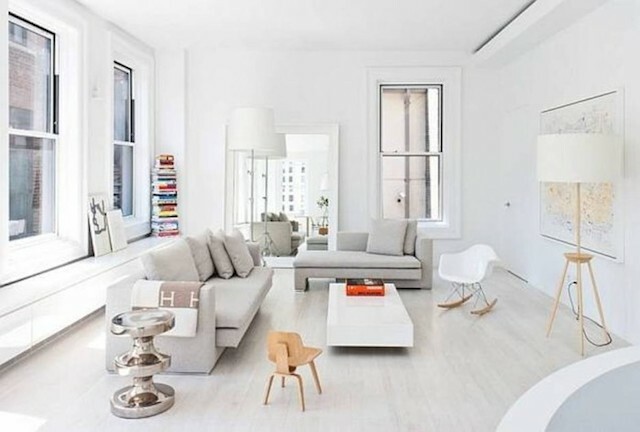 Being lean or a minimalist in decorating your living room doesn't mean everything has to be super modern. There are so many ways to add warmth and character to a room while still keeping it minimal. Of course it still needs to be functional for you, it comes down to being disciplined in your shopping and decorating choices. Think of decor and furniture pieces as having a purpose and reason to take up your precious living room space. Does that basket in the corner with extra pillows really need to be there? Or do you really need to cover every wall in your room or can there be (gasp) empty walls? Below are some tips for how you can create a space in your living room that is functional and cozy while still being lean and clutter free. Let's talk gallery walls for a minute. Both of these rooms have elements of minimalism while still having a full on gallery wall. Above, there are clean and even lines between the photos and the couch is very minimalist with its clean, straight lines. Below, the photos have a very similar color palette. The room is decorated with very minimalist furniture-straight, clean lines. Use a sofa with long, lean lines and minimal cushioning to give the room a clean look. Use a simple colored area rug to define the space and highlight furniture. Other than the rug, keep the floors clean of added clutter. Keep certain colors similar. If you have a large gallery wall to keep it from looking too cluttered, use all the same colored frame or a couple of the same colors for frames. Or you could do all the same colored print in the photo and use different colored frames. Have clean and well defined lines throughout the room. Try not to introduce patterns that are too intricate or art pieces that are too bold or outlandish. Use a fireplace or coffee table as the focal point of the room and keep those areas clean of clutter and unnecessary decor. Be okay with empty spaces. We have a tendency to want to fill every shelf and table with multiple pieces of decor. Keep things simplistic. Keep your surfaces clear. Don't clutter the room with furniture. If you need a lot of seating, there are other things you can do aside from adding in another fluffy couch to the room. You can have a clean lined bench stored behind a sofa that can be pulled out when guests come. Or use a coffee table that can double as seating when guests come like this or this. A minimalist living room may have only a couch, another chair or love seat, a coffee table a simple entertainment stand-not one with a bunch of shelves. Make sure to accentuate any natural light you have. Let the light just pour in to your room. Having a bright room just makes it feel cleaner and more minimalistic. Use white as much as you can without getting sick of it :) Every time I go to paint something white my daughter will say awe mom not white again!! But if I have things that are white, I can get away with using more decor or accent colors without it seeming too cluttered.